Canadian singer-songwriter and internationally touring artist, Lesley Young serves up a rich brew of contemporary folky-pop with a jazz twist. She melds these sounds and rhythms into a vision of passion and loveliness. Lesley and her longtime partner and musical collaborator John McKay-Clements formed a duo in 2001. John brings rock elements into the musical collaboration, with his musical roots in folk-rock, garage, psychedelic and experimental music genres. "Lesley Young has no problem baring her soul for all to hear, and that honesty has led to new heights of success." Says Justin Skinner of The Mirror, in Toronto, Canada. She was top five finalist in four International song competitions and 2nd place winner for a songwriting competition in France. Lesley’s and John have released a new single September 29th, 2018. Van online daten tot het NOS-journaal, en van darmbacteriën tot de dood. 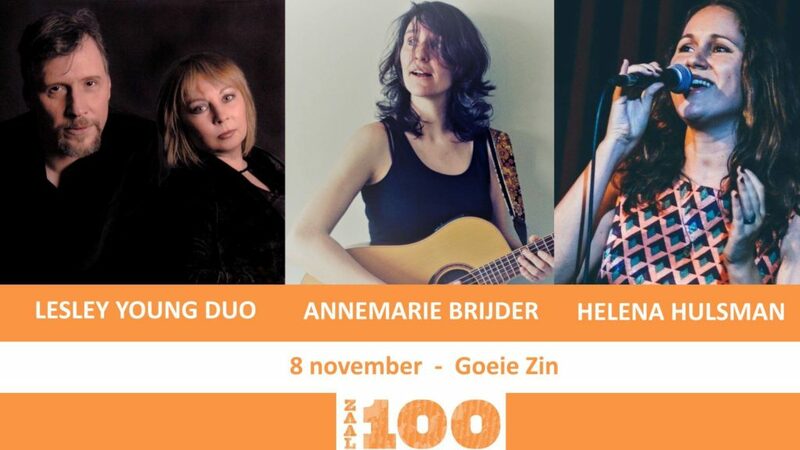 Annemarie Brijder zingt over alles wat ze niet snapt. Met haar chansons - in Nederlands en Frans - staat ze op podia in Nederland en Frankrijk. Vorig jaar verscheen haar debuutalbum ‘Evenwicht’ en dit jaar haar Franstalige album ‘Tu verras bien’.